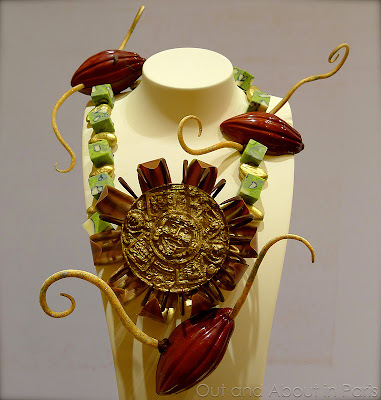 Chocolate necklaces made by Francisco Somoza of Spain and Luis Robledo of Mexico. While most people's attention was focused on the Rugby World Final between France and New Zealand yesterday, there was another international competition taking place at the Salon du Chocolat in Paris. Tension was running high as finalists from around the world neared the end of an eighteen month competition that would result in one of them being named "World Chocolate Master 2011". 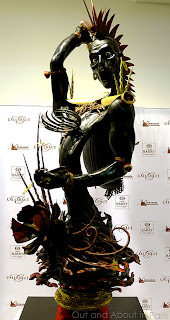 During this challenging chocolate competition, each of the nineteen finalists, who have already won the title of "National Chocolate Master" in their respective countries, produced a chocolate cake, two pralines, a dessert and one exceptional artistic creation based on the theme, "Cocoa, the gift of Quetzaicoatl". Even though Sylvain Bertolini, the executive pastry chef at the Bellagio Las Vegas, was representing the United States, I decided to follow the Swiss team, mainly because they were easily recognizable in their red and white shirts. Tension was already running high for the Swiss team as Claudia Schmid, head of ice cream production at the world-famous Confiserie Sprüngli in Zurich, focused on her artistic creation. A hush fell over the large room when the announcer commented that Claudia was running short of time and would perhaps have a problem completing her necklace. With their cowbells, red shirts and flags, the Swiss team was easy to spot. Fortunately, Claudia Schmid was able to complete this dazzling chocolate necklace with turquoise stones, golden cocoa beans and an amulet inspired by the Aztec calendar. Claudia's sculpture entitled, "Quetzalcoatl'z Favorite Spot", however, may have been overly ambitious because it crumbled into a rather heartbreaking pile of chocolate on the display stand, as did a couple of other sculptures. In a fortuitous stroke of good luck, the winner of this year's competition was announced at 9:50 this morning, just in time for me to incude the results in this post. Congratulations to the new "World Chocolate Master", Frank Hassnoot from Holland! Yoshiaki Uezaki from Japan placed second and Palle Sorenson from Denmark placed third. Winner Frank Hassnoot's chocolate sculpture, "Warrior: The warrior of darkness is in search for cocoa in the mysteries of the jungle". 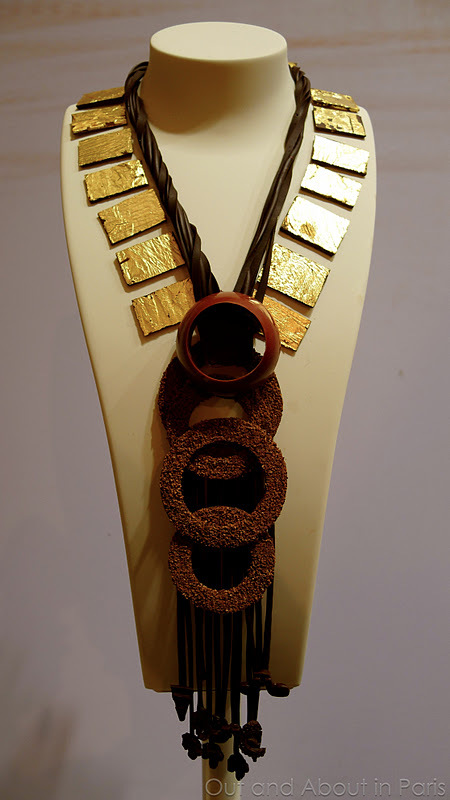 Jana Ristau from Germany won the award for best chocolate necklace. the winning necklace by the German is very nice, wearable even--most of what I've seen here and elsewhere is just too clunky and cumbersome looking to be a real necklace. I like the winner. The Swiss and their cowbells--nothing like embracing your stereotype. 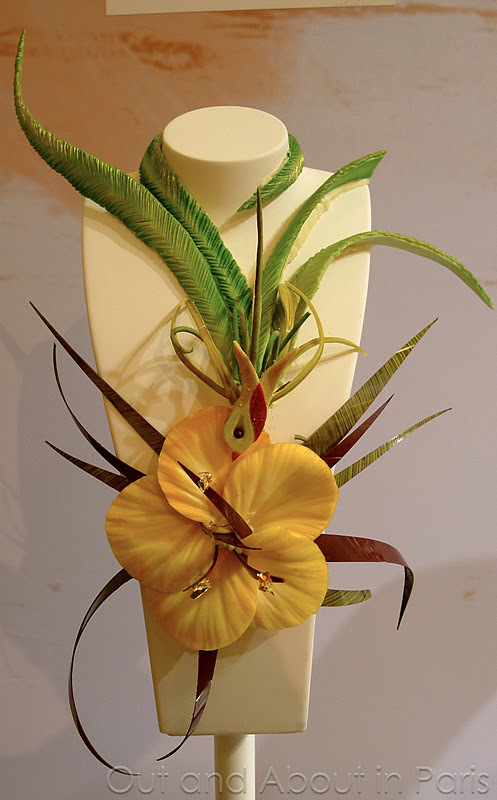 One of the things that I enjoyed the most about visiting the professional part of the Salon is that I was able to see a lot of chocolatiers and over hear their comments about the other creations. Many of them said that they felt that some of the necklaces were overworked. I loved the Swiss group and would have liked to hang out with them at the special "Claudia Schmid" table in the VIP section. I don't know if you'll remember, but you commented on the Burdick's (Boston) post about the fact that macarons are called Luxemburgerli in Switzerland. Anyway, Claudia Schmid works for the place that made them famous - Sprungli in Zurich. The German necklace would go very nicely with one of my black shirts, as long as I didn't wear it during the summer!